A green roof system is an extension of the existing roof which involves a high quality water proofing and root repellant system, a drainage system, filter cloth, a lightweight growing medium, and plants. Green roofs are becoming more and more popular in the US. - By evapotranspiration, plants use heat energy from their surroundings (approximately 592 kcal per L of water) when evaporating water. This reduces the 'Urban Heat Island Effect' in the summer. - Green roofs insulate buildings by preventing heat from moving through the roof. Their insulation properties can be maximized by using a growing medium with a low soil density and a high moisture content and by choosing plants with a high leaf area index (i.e. the bigger the leaves, the better). - On a summer day, the temperature of a gravel roof can increase by as much as 25 °C (77 °F), to between 60-80 °C (140 - 176 F). Covered with grass, the temperature of that roof would not rise above 25 °C (77 °F), thus resulting in energy cost savings. - 20 cm (7.9 inches) of substrate with a 20-40 cm (7.9 - 15.7 inches) layer of thick grass has the combined insulation value of° 15 cm (5.9 inches) of mineral wool. - Rooms under a green roof are at least 3 - 4 °C (5.4 - 7.2°F) cooler than the air outside, when outdoor temperatures range between 25-30 °C (77 - 86 °F). - Water is stored by the substrate, taken up by the plants, and returned to the atmosphere through transpiration and evaporation. - Green roofs reduce the amount of storm water runoff and also delay the time at which runoff occurs, resulting in decreased stress on sewer systems at peak flow periods. - Using green roofs can meet regulatory requirements for storm water management. - Growing herbs, flowers, and vegetables on accessible rooftops has many advantages. Source: National Research Council's Institute for Research in Construction. Green roofs can help to address the lack of green space in many urban areas. Studies show that leisure activities in natural settings such as gardens and parks are important for helping people cope with stress and in meeting other non-stress-related needs. You will need to know the slope, the structural loading capacity, and existing materials of the roof, as well as the nature of any drainage systems, waterproofing, and electrical and water supply in place. You should also consider who would have access to it, who will do maintenance, and what kind of sun and wind exposure the roof gets. Plant selection depends on a variety of factors, including climate, type and depth of growing medium, loading capacity, height and slope of the roof, maintenance expectations, and the presence or absence of an irrigation system. A landscape architect would be able to advise you on suitable plants and design of the plantings. See the landscape contacts below. The cost of a green roof varies depending on plants, size of installation, and use of irrigation. 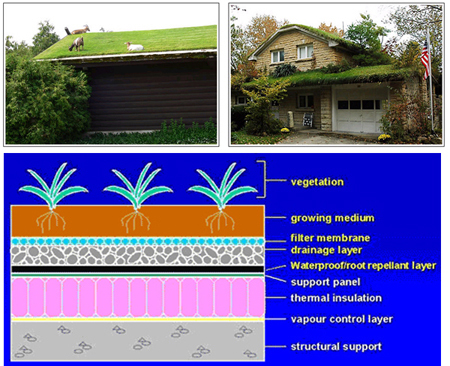 An installed extensive green roof with root repellant/waterproof membranes may be installed for $10-$24 US per square foot. Speak to a qualified green roof professional about the range of costs and benefits for different green roof systems and designs. Search "green roof professionals" in our online member database. Landscape architects and contractors frequently design green roofs and can install the living components (i.e., growing medium and plants). It's recommended that you choose a qualified roofing contractor with experience in green roof installation to install the non-living components (e.g., vapor barrier, waterproof membrane). You can also contact a roofing consultant, who will assess your roofing design needs, ensure quality control, and recommend a suitable green roof system.